Pamper yourself, friends, and family with this amazing 3,200 sq. ft. home. Located just blocks from the beach and steps to the center of town the Westover home features four master suites with king beds, one kid's bedroom with two twin beds, and five and a half bathrooms. This spacious home has amazing appeal with hardwood floors throughout the open floor plan. The slab granite counter tops with white cabinets draw your eye into the large and spacious kitchen. The first floor has a mother-in-law suite with a king bed, bathroom, kitchenette and dining area. The other two bedrooms on this floor are comfortably furnished master suites with king beds and en suite bathrooms. After making your way up the stairs you will come to a large loft area that is perfect for children with a comfortable couch, coffee table full of kids books and TV with DVD. There is a kid's desk and a kid-size air hockey game. Close by is a bedroom with two twin beds and a guest bathroom with a large soaking tub. Finally, there is another spacious master suite with a king bed and bath. This home sleeps ten in beds but has a 14 occupancy limit which includes visitors. No pets or smoking are allowed. The fully fenced front yard and a large wrap around deck are great for the little ones to play in. The garage comes equipped with a full size side by side refrigerator and freezer, bikes, ping pong table, beach toys, wagon and portable kid's basketball hoop for added fun. Come enjoy this large piece of paradise on the north Oregon coast! Communication was great from the very beginning. It was evident they wanted us to enjoy our visit. It's the best beach house we've ever stayed in. So spacious, big bedrooms, large kitchen and the garage full of games was a big hit! 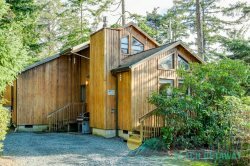 Great location in Manzanita, close to town shops and restaurants and beach access is straightforward. The property was extremely clean and well cared for, and the space accommodated 8 adults and a few kiddos with ease. The parking space at the bottom of the drive is tight, but we had no real problems other than moving vehicles slowly and cautiously. Communications were made proactively, and as a result check-in/check-out experiences were painless and convenient. Would definitely stay here again - the house provides great versatility for a family getaway. No contact was needed other than routine emails. The house was very clean upon arrival. The house is large enough for everyone to have their own space/bathroom but still gather together. The kids kept busy playing ping pong and basketball. We were very pleased with the location, we walked downtown and to the beach several times. Our family will stay again! Very positive. Only suggestion is to add a king bed in the loft area to accommodate 2 more people. Comfortable, clean, very nice. We'll be back. We really enjoyed the layout of the house and especially that all of the bedrooms were masters. It worked well for our 4 families. So CLEAN! Great furnishings throughout. The reservation process was quick and easy. This location is a short walk to the beach, shopping and restaurants. It is warm and comfortable. This is a very well appointed home, in the perfect location. Our family takes a trip to Manzanita each summer and this is by far the best house we've stayed in. The bedrooms are large, each has its own bathroom. The kitchen is stocked full, there is an abundance of linens and wonderful toys for kids little and big. We will return and highly recommend to others.